1. Bristol Blenheim Mk.l K7078:139 J of No.139 Squadron, RAF Wyton late 1937. 2. Bristol Blenheim Mk.l K7045:114-Z of No.114 Squadron, RAF Wyton, 1938. 3. Bristol Blenheim Mk.lf L1426:RX-M of No.25 Squadron seen at RAF Northolt, August 1939. 4. 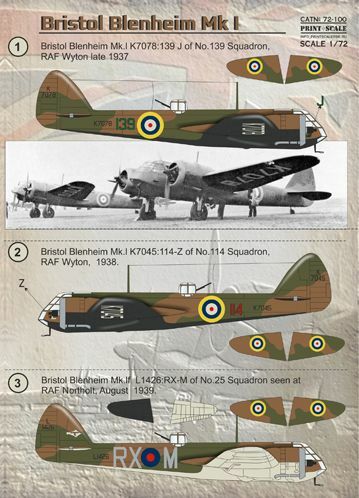 Bristol Blenheim Mk.l BL-138 of 1LeLv 41, Finnish Air Force 1941. 5. Bristol Blenheim Mk.l L8612:OB-W of No.45 Squadron, Helwan Egypt 29 July, 1940. 6. Bristol Blenheim Mk.l No.26 for Escadrila 1 recunoastere-bombardament from Focsani-North airfield in Moldavia buring the fall of 1941. 7. Bristol Blenheim Mk.l BL-117. 8. Bristol Blenheim Mk.lf L6733:FK-D of No.219 Squadron, RAF Catterick. March 1940. Fighter Command black (port) and white (starboard) underwing markings. 9. Bristol Blenheim Mk.l BL-106. 10. Bristol Blenheim Mk.l 34911:AD-H of No.60 Squadron based at Ambala, India, 3 October 1939. 11. Bristol Blenheim Mk.l L1134:PT-F of No.62 Squadron based at RAF, Tengah, Singapore, February 1941.